Valentine’s Day is all about L-O-V-E, whether it’s romantic, for your family, or for your best friends. We wanted to help you share your feelings for the ones you care about with some essential oil-themed Valentine’s Day cards, and in our opinion, the sillier they get, the deeper the love. Send one or one hundred to your very dearest or to your whole Young Living team! 2. Pick your essential oil Valentine’s Day e-card. 3. Click the blue checkmark in the right corner. 4. Enter your name and email, then press submit. 5. Click the “Download & Share” button to download your Valentine’s Day e-card. 6. 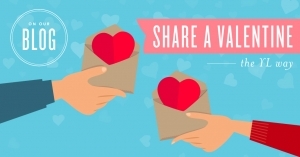 Share your YL Valentine’s Day e-card on Instagram, Facebook, email, or wherever you would like to share it. now try these 28 ways to invite love into your life! What are some of your favorite essential oil puns?